As a small business owner, anything that helps drive up traffic on your website will be welcome and in a similar manner, you would also want to look out for anything that might drive down your traffic. Now that Google has rolled out its Mobile First Indexing algorithm, your website’s ranking should be a little different than it is used to. This is especially true for websites that were not optimised for mobile users. Mobile First Indexing refers to a case whereby websites with mobile versions are given higher rankings by Google in search results compared to websites with only the desktop version. This means that mobile versions of your website will be the first priority for indexing but not necessarily the only one to be considered. Nevertheless, lacking a mobile-friendly web content should now negatively impact your online presence. Therefore, should you boost your mobile version, you stand to enjoy better rankings when searched by mobile and desktop users alike. However, if you have a responsive website that is similar to a mobile version one, there is nothing much you can do to acclimatize with the mobile first indexing introduced by Google. This is also true if you are okay with your current page rankings and see no need to change the status quo. Nevertheless, responsive websites still need to stay on point in terms of loading time if you are to retain your visitors. For instance, your page images and any other dynamic elements should be well optimised for a better mobile experience. Those who have disregarded this fact are likely to experience low rankings resulting to low page visits, and ultimately fewer lead generations. All these compounded can deal a devastating blow to your business. 55% of web visitors are mobile users and Google’s latest move to introduce the mobile first indexing is just as important to mobile users as it is to SMB owners. Therefore, optimising your website for mobile content is a great way to tap into the 55% of web users as well as staying up in ranking on Google. Need help with creating a mobile-first indexed website for business? Talk to the experts at Prodigitas. 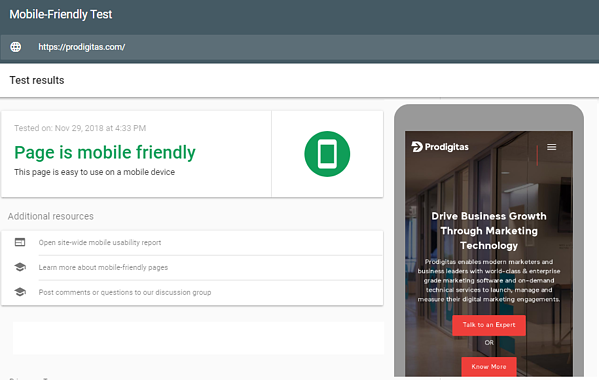 Prodigitas enables businesses to create search engine friendly websites for both desktop and mobile devices, to enhance search engine rankings and organic traffic.